I was nominated for “The Lovely Blogger Award” by Marla Rose Brady!! A big thank you to Marla!! Check out her blog at http://marlarosebrady.wordpress.com/. 1-Mimi is my real name. It’s not short for Miriam, Michelle, etc. 2-My nickname as a kid was Mooze. Nobody in my family has a clue how this came to be. 3-I prefer to stay home than go out. I’m not a big fan of crowds. 4-I’m afraid of thunderstorms. Sometimes, I’ll hide in the basement. 5-If I was given the option to drive or fly to a destination, I’d rather drive. 6-I’m of French, Italian and Aboriginal descent. 7-My alarm clock is set at the sound of chirping birds. 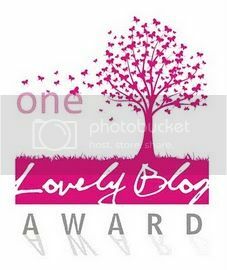 Include the blog award in your post. Thanks SO much for the nomination Mimi! Congratulations on your award, sorry it has taken me so long to see it. Thank you so much for nominating me, I feel very honoured. You’re welcome! Your blog is really great!